LAWRENCE — It is not uncommon for aspiring educators to student-teach or work with a veteran teacher before taking the lead in a classroom. A program at the University of Kansas has taken undergraduate students across an ocean, placed them in a classroom in which they teach English, develop and implement their own lesson plans, all with the goal of becoming more well-rounded, empathetic educators. And the program’s directors have authored a book chapter for other educators looking to take students through a similar experience. Hyesun Cho and Lizette Peter, assistant and associate professors of curriculum & teaching at KU, created the unique study abroad opportunity for KU students to travel to Gwangju, Korea, to teach English in secondary schools. Two groups of students have already completed the program, and a third group will depart for Korea in May. The trip is the first classroom teaching experience for many education majors who will eventually teach in different grade levels and content areas in schools in the U.S. For many, it was also their first trip abroad. Cho and Peter detail the students’ experiences and outline “opportunities for critical awareness and community-building among preservice teachers” in their chapter in Handbook of Research on Efficacy and Implementation of Study Abroad Programs for P-12 Teachers, edited by Heejung An of William Paterson University of New Jersey. The faculty-led teaching practicum is different than most study abroad experiences, Cho and Peter write, because as teachers and not simply students taking a class in a different country, they gain several valuable benefits. Participants develop a better understanding of English language learners, their needs and challenges. Students are required to consider their own identities as teachers and reflect on what it means to be a teacher, a native English speaker and issues of race, ethnicity and gender and to write about their experiences. 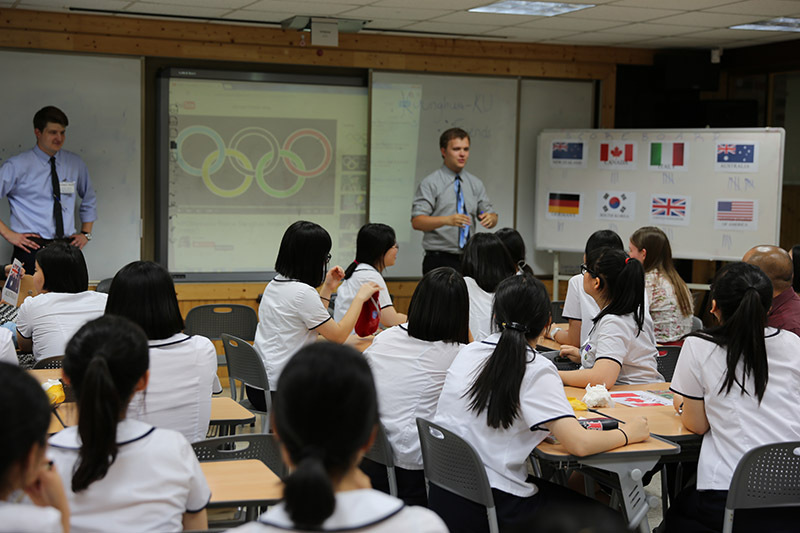 The future teachers were also required to develop and implement their own lesson plans for their English classes in Korean schools. Program leaders provided the students with daily feedback on the lesson plans, which parts were effective, where they could use improvement and more. They also were also required to explore community engagement, a vital part of a professional teacher’s role. Program participants stayed in dormitories with the students at the schools and interacted with them in various contexts outside of the classroom, including in school cafeterias, in the hallways and in the community. Cho points out that was often some of the most valuable learning the participants experienced, realizing that they can learn from their students in situations such as when the students taught them Korean phrases. All of the students in the program received Freeman Foundation Scholarships offered through the Office of Study Abroad to support their six-week internship experience. The participants continue their community practice by engaging in a community outreach project upon their return to the U.S. Several of the students each year are education majors, while others are Korean or East Asian Studies majors. The education majors will put their lessons learned to work in the classroom, as teachers are all but guaranteed to work with English language learners in their classrooms at some point. The international experience also opened up ideas about career possibilities. Effective English language teaching is not something one can master simply through a basis in theoretical and practical knowledge, but through transformative teaching, Cho and Peter write, and students are able to experience that by becoming reflective learners and understanding the social and political effects of their craft through experience in the program. Cho will take the third cohort of students to teach in Korean schools in late May. While there she will continue to work with the new group of pre-service teachers as well as work to establish an exchange program with a Korean university and gather data for further research on the program. Cho and Peter write that the program has highlighted the value of such an experience for pre-service teachers to grow personally and professionally and recommend the field prepare better teachers by infusing a critical perspective on English language teaching throughout the program and by building a community of practice among student teachers, faculty supervisors and cooperating teachers.